A relationship break up letter might help you end your relationship easier. 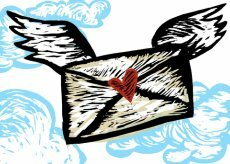 If you feel too guilty or scared to do it in person, and are delaying the inevitable, a Dear John/Jane letter can serve you well. Writing a break up letter will give you time to put your thoughts together and express everything in a clear and compassionate way. Below are a few tips for writing your letter. Try to keep your letter clear and as short as you can to make it less painful for your future ex to read. What should you tell them? You can tell them that they are a wonderful person, but you just don't mesh. Say that it's no one's fault, and that it's hard for you too. Don't blame your partner and avoid saying anything negative, to prevent having any regrets in the future. Be positive about each others future and wish them well. Reinstate that there's no turning back, and that nothing can be repaired. You are a wonderful person, but unfortunately we don't match. It's nobody's fault and it's hard for me too, but I've made my decision, and there's no turning back. I wish you well. I know that both of us will find the right person for them someday in the future. Once you have completed writing it, put your letter aside for a couple of days, and read it again before sending. Sometimes reading things over can confirm your decision even more or rethink things. back to the How to End a Relationship page.